Participants in the Market Hog Showmanship event lead their hogs through the judging arena as Kane Causemaker decides on the best showman at the Rio Grande Valley Livestock Show Friday, March 16, 2018, in Mercedes. MERCEDES — Champion showman EJ Guerrero of Harlingen kept piercing eye contact with the judge all while steadily steering his Dark Cross hog throughout the arena. The judge noticed Guerrero’s tenacity and skill with his 280-pound hog, Notorious, during the showmanship competition held at the Rio Grande Valley Livestock Show grounds Friday morning. 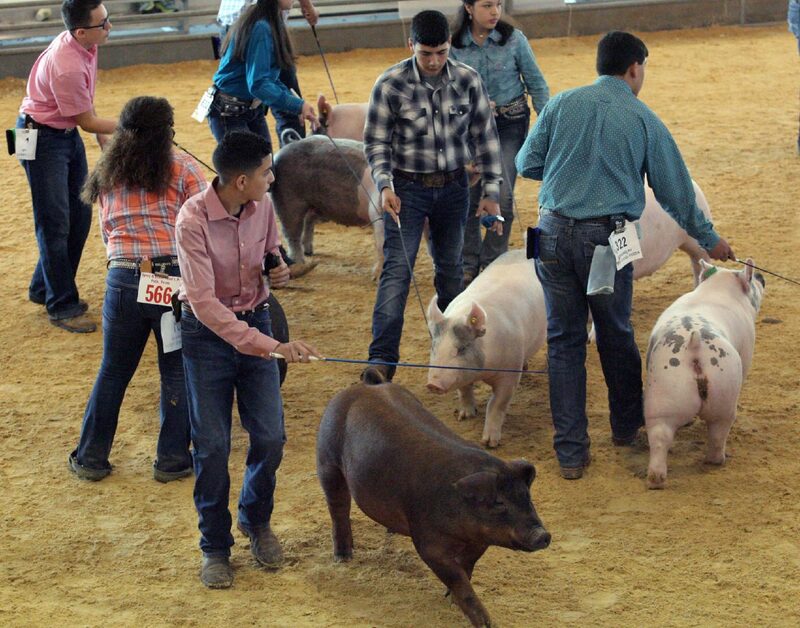 Guerrero, a Harlingen High School senior, was among one of eight finalists in the ring aspiring to get their hands on a ribbon or, better yet, the championship belt buckle and money that comes with being named champion showman. High school FFA students show their skills during the Market Hog Showmanship at the Rio Grande Valley Livestock Show Friday, March 16, 2018, in Mercedes. Students in the showmanship competition are judged on their ability to present and handle the animal. Edcouch-Elsa FFA student Delilah Bernal keeps eye contact with judge Kane Causemaker during the Market Hog Showmanship at the Rio Grande Valley Livestock Show Friday, March 16, 2018, in Mercedes. A hog is led by its' handler during Market Hog Showmanship at the Rio Grande Valley Livestock Show Friday, March 16, 2018, in Mercedes. 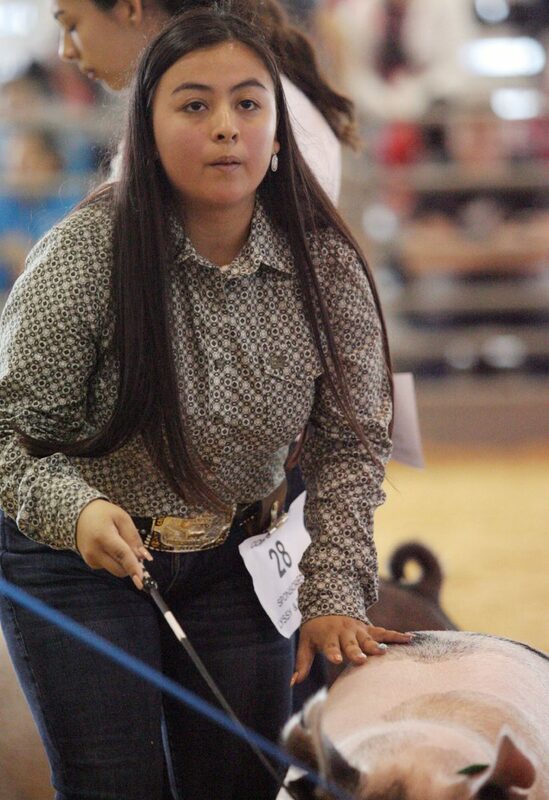 Jesselen Tijerina of La Villa High FFA leads her hog "Bailey" during the Market Hog Showmanship at the Rio Grande Valley Livestock Show Friday, March 16, 2018, in Mercedes. “I can tell they’re going to be leaders,” Causemaker said prior to naming the awardees. But there can only be one champion. This time, it was Guerrero. “I am very excited to win this,” he said. 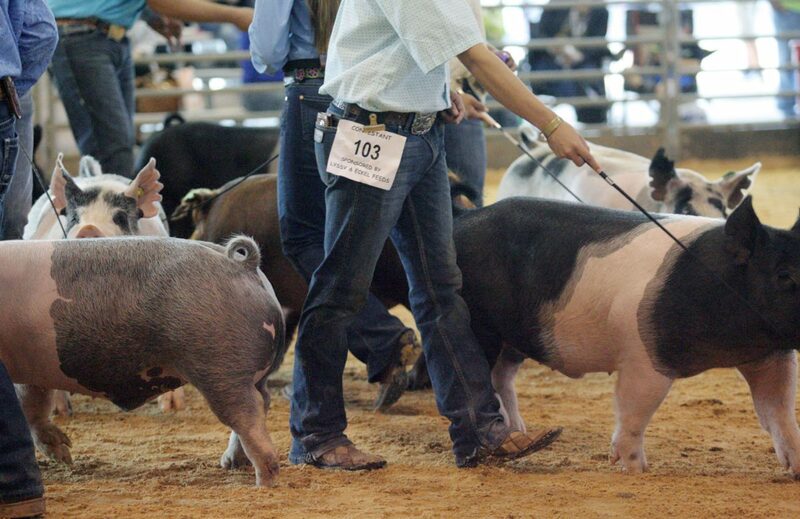 Guerrero had already won fifth place in the judging of market hogs held Thursday morning. Guerrero had been preparing for this day for more than 10 years, having worked with livestock since he was about 8 years old. Guerrero’s father, Eduardo Guerrero, has an agriculture degree and was there to celebrate while fellow competitors praised and congratulated his son. 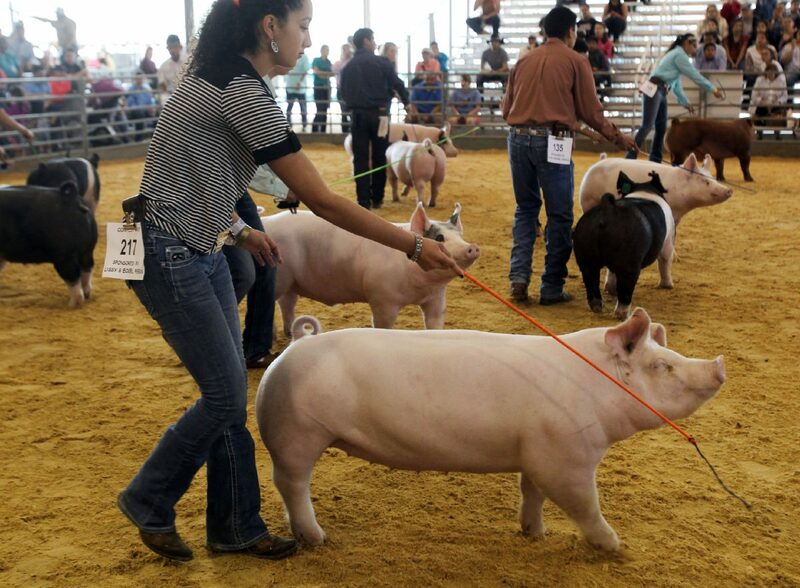 In the showmanship contest, competitors must calmly guide their hogs throughout the arena while maintaining composure. If the hog runs off to the rails, urinates or cannot be directed by its owner, the competitor isn’t likely to advance to the next round. The competitors guide their animals using a hog bat — a stick used to direct them from left to right through training. When a hog stops abruptly, competitors often tap their hind legs prompting the animal to move in a forward direction again. Guerrero said he was proud of Notorious, having raised him to compete. The pair previously won grand champion at the Edinburg Cougar Classic. Having raised a farm animal helped Guerrero become even more disciplined by having to wake up extra early before school to tend to Notorious at the school district’s agriculture and farm building. The competing hogs will be sold within the coming days. Guerrero’s next goal is to attend Texas A&M University in Kingsville to major in criminal justice and minor in the agriculture field. 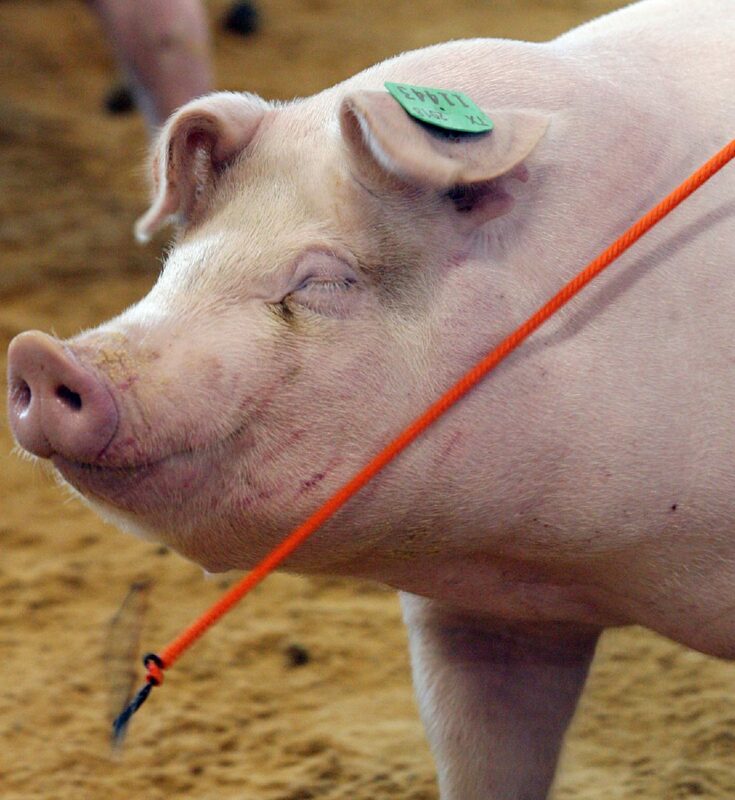 Here’s a list of market hog division winners during the competition held Thursday.